I was born in Iowa and grew up in Vermont. As a young child, my mother sent me into the yard saying, “There are a hundred colors of dirt out there. Go make me a picture!” From these beginnings has come a life of expressing myself through art, inspired by people and nature. After twenty years of running my own organizational development company, I celebrate my life as an artist every day. 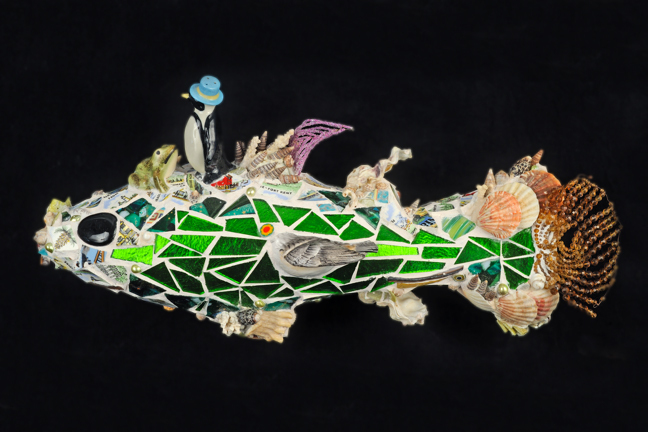 To achieve the bold statements I’m after in both sculpture and wall art, I use a combination of mosaic, three-dimensional collage and recycled materials assemblage. Although not trained as an artist, I have recently studied with several mosaic masters and work in Italy has prompted the use of ancient techniques with my modern aesthetic. A recent class in iron sculpture at Penland School of Fine Craft enables me to add metal work to my sculpture. My art reflects my love of intense color, bold texture and ordered chaos. Faces are a special passion and I use a combination of abstraction and realism to convey personality and circumstance. An inclination to celebrate what’s right in the world adds a sense of humor and sometimes whimsy to my work. My art has been exhibited along the east coast, including NYC, Bucks County, PA, Connecticut, Frederick, MD and many venues in the DC area. It is in private collections throughout the eastern US.